Unsalted cultured vegetables (cv’s) are made with raw vegetables and starter. But what we’re really after is the enzymes, vitamins, and probiotics contained within. I created this sweet ‘n sour combo for kids of all ages, especially those on The Body Ecology Diet (B.E.D) who are healing from autism and Candida. I wanted to make something fizzy with bright color…in walked Purple Potion. Most everyone loves this recipe. If not, there’s always garden blend 🙂 If you’re not convinced about probiotic-rich, check out the benefits here. Beets are not typically allowed on a candida cleansing diet like B.E.D., because they contain a lot of sugar. 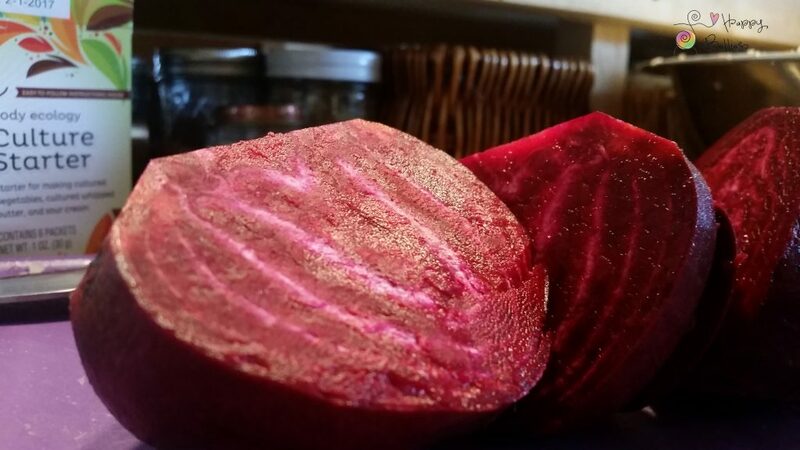 The method of culturing them, as this recipe does, makes them compatible because the probiotics in the culture starter eat up the sugar that is naturally found in the beets. Leaving you with all the great liver/blood cleansing properties of the beets and the aliveness of the probiotics. My youngest boy in the photo here started eating cv’s when he was 2 yrs. old. He eats them with every meal, even the cabbage logs, just stuffs the entire thing in his mouth. My oldest is more reserved, but if it’s Purple Potion he’s more likely to eat them. Dissolve culture starter and EcoBloom in ¼ c. warm filtered water (90 degrees F). Allow to sit on counter for 20 minutes. Clean and chop veggies and apples into pieces that fit into your food processor. Remove 1/3rd of mixture and blend/food process (may need to do in 2 batches). Blend with enough of allotted 3-4 cups of filtered water until consistency of thick juice. Place into a big, clean bowl with culture starter mix, rest of grated veggies, and lemon. Mix with two big spoons, or clean hands. Pack tightly into jars with a potato masher or your fist to force out air pockets. Fill jars, allowing liquid to cover vegetables with about 1 1/2-inches of head space. Roll reserved cabbage leaves to form tight logs and put on top of veggies (push down so liquid just covers “logs”) – add more brine if needed) – leave 1-inch at top for expansion. Culture for 3-10 days, at 70-72 degrees F in a dark spot (I created this Oven Incubator Kit to keep temp. constant). Enjoy up to ½ cup with meals. Scald equipment or wash in hot, soapy water. You can also spray everything with food-grade hydrogen peroxide and dry off with paper towels. CV’s will continue to ferment at a slow pace in the fridge. They keep well for weeks, even months, and become softer and more delicious like a fine wine. Ready for variety? Try my beginner’s recipe for Garden Blend cultured vegetables. Take it slow! CV’s are rich in enzymes and probiotics, so ease yourself into this strong food. Once your body gets used to the extra gut activity, slowly up your dose. Donna Gates, creator of B.E.D, suggests a therapeutic dose of 1/2 cup with every meal. Enjoy as they are; toss into salad; roll in deli meat; or eat with dollop of mayo.